We offer a wide range of Yaskawa products including AC Drives, Motors, controls, monitors, power supplies and related components widely used in CNC, Motion and Crane applications. Our engineers and technicians are experts when it comes to Yaskawa products and will be happy to troubleshoot your equipment malfunction and advise the most optimal solutions. Please search within our database for new, refurbished Yaskawa products, as well as repair services and exchanges. We guarantee highest quality of services, fast processing cycle-time and unbeatable pricing. Magnetek drives are designed with reliability and economy in mind! The hardware and software were designed and extensively tested specifically for the operating conditions seen in overhead material handling applications. Hitachi America, Ltd. is a subsidiary of Hitachi Ltd., the leading provider of advanced industrial infrastructure and equipment for use in consumer products and complex industrial applications. Hitachi is the world renowned manufacturer of state-of-the-art industrial equipment and systems known widely for their immense contribution towards the fulfillment of ever evolving needs within the industrial environment. Precision Zone is proud to be authorized to distribute Hitachi AC Drives and related components widely used in industrial control applications. The product line includes AC Drives from the following series: WJ200, NE-S1, X200, SJ700, L700 and SJ700. Founded in 1974, Hinode Electric is one of the leading fuse manufacturers globally. Hinode is producing and supplying over 500 types of industrial grade fuses in as many as 23 product series, each designed with different ratings for the circuit protection of semiconductor devices, inverters, UPS, power sources, and so on. Precision Zone is authorized to promote and sell Hinode fuse products in the USA. Whether you are looking to replace a 1 or 2 burnt fuses, or are looking to source large volumes of fuses for your production lines. we are here to support you. Backed by Hinode engineering team, we are happy to provide cross-brand fuse model references and share detailed technical information about Hinode fuses. Please feel free to contact us with any questions. In the mean time please take a look at the featured Hinode fuse products. Technicians and engineers across many industries are well familiar with the reliable and accurate Hioki tools and instruments. TECO-Westinghouse Motor Company is a world leader in manufacturing electric motors and generators, with a broad selection ranging from ¼ hp to 100,000 hp. They also supply motor controls, engineering services, genuine Westinghouse renewal parts and large motor repairs. TW's products are used to drive pumps, fans, compressors, rolling mills, grinders, crushers, and a variety of other rugged applications. MK Technology Group is a leader in industrial framing solutions. Their four business units, Profile Technology, Conveyor Technology, Linear Motion and Factory Equipment are built on an extensive modular aluminum profile system with more than 250 profiles. MK framing solutions target virtually all mechanical sub-functions associated with factory automation, and as a provider of custom transfer systems with all-inclusive service. Among engineers and technicians Hakko's name is kept in high regard for their superior quality soldering and desoldering tools, hot air rework stations, smoke and fume extraction systems, technical training classes, and a wide assortment of accessories and related equipment for the electronics, industrial and hobby industries. We are proud to be authorized to distribute Hakko soldering products and supplies. Please feel free to contact us with any questions about Hakko products, or click the button to browse their product lines. As any technician will agree, it is a pleasure using high quality hand tools, especially the ones designed and manufactured with utmost attention to detail, ergonomics and functionality. 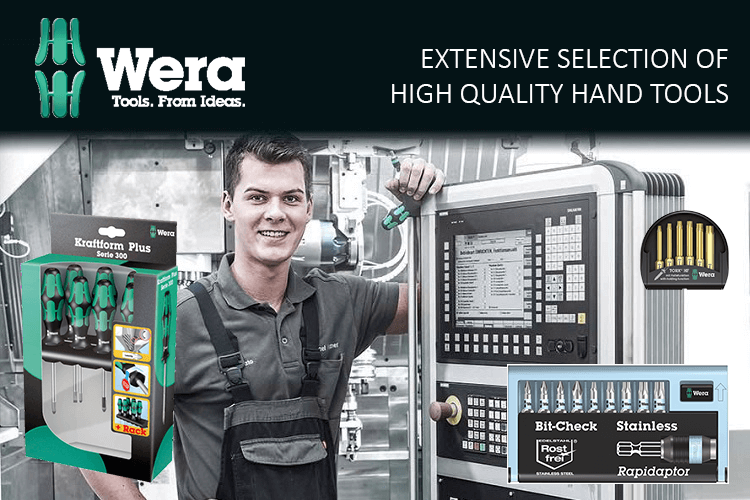 We are proud to be authorized to distribute an entire line of WERA TOOLS and supplies. Please feel free to contact us with any questions about Hakko products, or click the button to browse their product lines.